I'd like to introduce you to Faye De Lanty; presenter, fashion blogger and advocate for sustainable fashion. Faye, currently based in Sydney, Australia, will soon be migrating to New York. 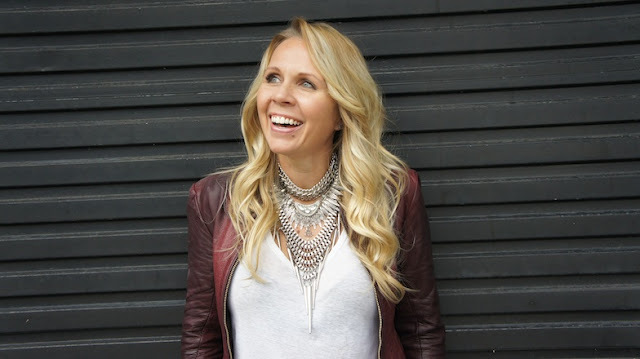 Australia will be losing a recycled fashion supporter to The Big Apple, but before she leaves, Faye will be running exclusive thrifty projects in the Land Down Under. Truth be told I've always been a little bit thrifty. For as long as I can remember I’ve had a strong hunting instinct – a hunger for knowledge, experiences, new ideas and inspiration. Perhaps I’m part sniffer dog, perhaps it’s the storyteller in me, perhaps it’s just that I am forever a slave to fashion love. ‘Necessity is the mother of all invention’ rang very true for me while living in NYC and London. Fighting hard for work and to find my way, I went to job interview after job interview, meeting after meeting. I couldn’t afford new clothes but I had to keep up my chic…so I started pulling outfits together from charity stores. It seemed I had a knack for it because people would always gush over the great ensembles I rounded up. ‘That looks so expensive’ or ‘This must have cost a fortune’ they would say, when really it very rarely set me back more than 20 quid. My best friend would always laugh that here she was dripping in designer when all the eyes were drawn towards my ‘1pound pretty’ aesthetic. And so in honor of my beloved beagle Soho [may god-dog rest her soul] I decided to share my tips and tricks for living a pre loved life of style – Fashion Hound was born. 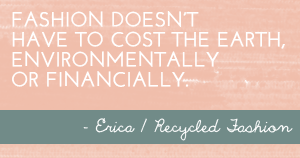 In a world of excessive consumption and consumerism, I'm all for a 'waste not want not' ethos. Don't get me wrong High end 'Haute' and designer is delicious, I just think that when we can we should strive for fashion with a conscience and re-use, recycle, re-invent and re-write the followed fashion path. In turn we are supporting charities, saving cash and the planet! If you ask me, it’s like a glorious treasure hunt or winning the fashion lottery when you score a one off wonder… and bonus deal - you will never look like anyone else baby! Now I'd call that a sartorial win-win wouldn't you? I’ve spent the last two years fashion hounding my little heart out, showing people how to create on trend looks for less and lean towards more eco conscious fashion choices, in turn teaching myself so much along the way. I now have a regular segment with Channel 9 mornings which can be seen here, and here. 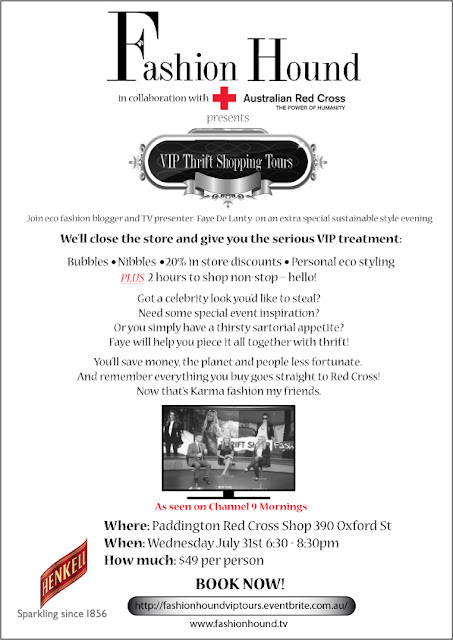 I am super excited to launch my VIP THRIFT SHOP TOURS with the RED CROSS. This is an extra special style evening in Sydney where we close the Red Cross Paddington store and thrift-anistas can sip champagne and op shop til they drop shop with 20% in store discounts on gorgeous second hand and pre-loved or surplus designer stock. 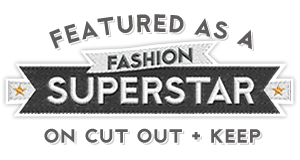 It’s a huge passion of mine to change the stigma attached to thrift stores and indeed the excessive and toxic waste the fashion industry contributes too. There is so much great stuff that can be found in these stores, there really isn’t much need to buy new. This I hope will be the first of many tours and not just in Australia…next stop New York City! There is also an exciting eCommerce development in the works - thrift is about to get even more chic and totally tech savvy. Thank you Faye, good luck with your first VIP Thrift Tour (anyone Sydney based can book on her exclusive VIP Thrift Tour here), we look forward to hearing all about it, and your future endeavours.